What size should the images in my email signature be? A question we get asked a lot is "What size should the images in my email signature be?". There is no right or wrong answer, but there is a professional design opinion and that's what we're giving out today. 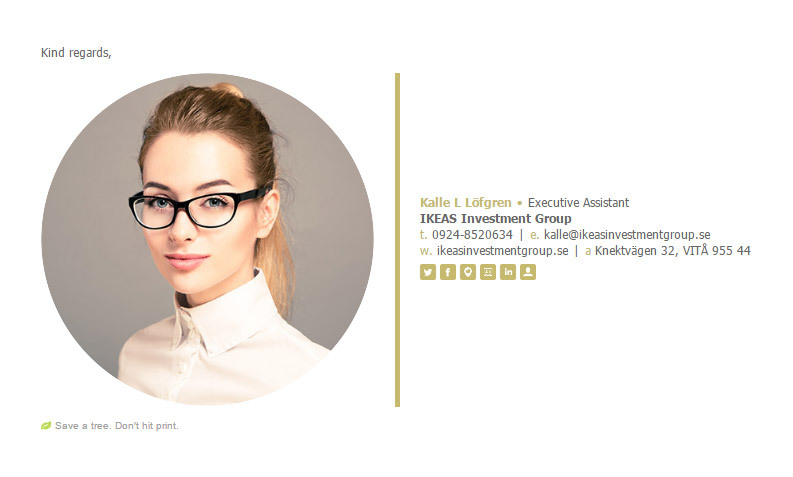 Is there a place for including large size images in email signature design? As with most things in life, there's a time and place for everything. 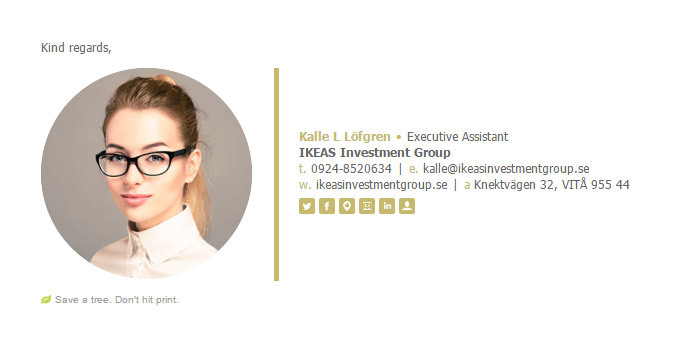 If you're considering using large images in your email signature design, they can look really great, especially when done right like our Hareee example. What about large profile photos, headshots or business logos in email signatures? In our professional opinion, there is no place for including really large business logos or profile photos, like this example. Just think, it could be a little startling to your email receivers when they receive a life size version of you in their inbox. Here's a much better way to include a larger profile photo if you really want to. Having a purpose for the large photo to show off your shop or products is a much better idea, than just a really large headshot of yourself. As for your logo, it doesn't need to be huge to stand out and be memorable. Check out this nice email signature design with a small logo - it has just as much, if not more impact being small than it would if it were two or three times bigger. If you're still contemplating using large images in your email signature, you should also be aware that large images cost your email recipients bandwidth to download them, not to mention their time on slow internet connections. Plus if you're using retina images in your email signature, it's probably best to avoid using really large images, due to the size of the already large image now being doubled. Also, you'll need to check and make sure any large images still fit and look nice on mobile devices. All email clients and email apps show images differently. Some might scale the image to a nice size for the screen for you, but others don't scale images at all, so the size you send, is exactly the size shown on the screen. How about including medium size images in email signatures? We're going to go ahead and say that medium size images do have a place in email signatures. Medium size images can be used really well in banner images to show off particular products, events, services or sales. You can use medium images size images for portrait and profile images too. But be careful not to go too overboard. There is a fine line between a medium profile photo and a large one. We'd go with more of an in-between small to medium size profile photo rather than medium to large. Check out our example below of what we could consider a medium size image in an email signature and compare it to the large one above. Small size images work really great with profile photos and logos. They don't cost your receivers a tonne of data download and their quick to show up inline, even with slow internet connections. Best yet, when you use small images and make them retina-compatible (by essentially doubling their size), they are still pretty small in size. And the smaller you go, the more likely they will fit and look nice on mobile devices too. Our best advice would be to include small to medium size images for logos and profile photos. And small to medium size images for banners. Only include large images if it's for a good purpose.